While they remain controversial politically, the HOT lanes on I-405 between Bellevue and Lynnwood are increasingly popular with transit users and the drivers who use the lanes. Higher than forecast driver demand has led to higher toll revenues, and those revenues are being put to work to benefit drivers in the corridor. The first improvement is a 1.8 mile shoulder lane for general purpose traffic between Canyon Park and I-5. The improvements may also benefit transit users. As demand has grown, average peak time toll rates have crept up from $1.75 in late 2015, to $2.40 in the first quarter, to $2.72 in the second. In June, the HOT lanes served 1.2 million vehicle trips, over 800,000 of those tolled. With higher prices and HOT lane volumes, WSDOT now anticipates revenues will exceed earlier forecasts by about $20 million per biennium. The lanes have worked well for transit too, with Metro seeing 8.2% more riders. Average travel savings are 2.1 minutes in the AM and 5.8 minutes in the PM. Community Transit’s peak ridership is up 3% with improved travel times for most routes. Initially, express lanes were tolled at all hours. In a concession to tolling opponents in the Legislature, that was pared back earlier this year so tolls now apply only between 5am and 7pm weekdays. The lanes are open to all drivers at other times, although center HOV ramps in Bellevue and Totem Lake are HOV/transit only when tolled access is not available. Travel times for drivers in the general purpose lanes are generally better than before, particularly southbound. In the northbound direction, traffic flows more freely through Bellevue and Kirkland. But this has exacerbated a bottleneck at SR 522 in Bothell, where five lanes (2 HOT + 3 GP) converge into three (1 HOT + 2 GP). The highway remains congested until near I-5. Nearly 1,000 vehicles an hour merge onto I-405 at Canyon Park in the PM peak, adding to delays. 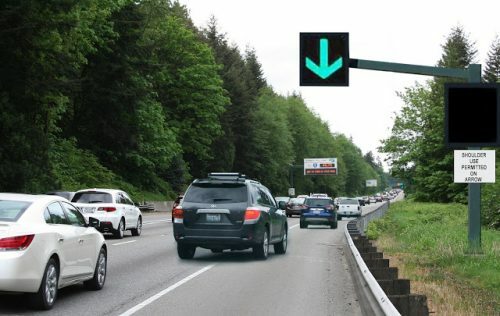 WSDOT hopes to ease that bottleneck by adding shoulder-running on the northbound side of I-405 between SR 527 and I-5. Unlike the short bus-only shoulder lanes on SB I-405, the northbound shoulder will be available to all vehicles. The added shoulder lane would start where the merge lane from the SR 527 on-ramp ends, and extend to the exit lanes near I-5. The shoulder lane will be opened when speeds in the two GP lanes slow. Access to the lanes will be signal-controlled. Effectively, it is a third general purpose lane at high volume times. ST Express and other buses already run on the shoulder in several places on SB I-405 in the Bothell area, and this has improved performance for those buses. As an “early deliverable” for ST3, Sound Transit pledged to look at shoulder-running for buses elsewhere. WSDOT will allow buses to use these shoulder lanes along with other vehicles. However, the WSDOT plan eliminates the opportunity for exclusive transit use of the northbound shoulders. Sound Transit and WSDOT expect increased general purpose lane capacity will be better for buses than the status quo. Because I-405 lacks center ramps in this area, there are no plans for Sound Transit buses to move to the HOT lane. Even the I-405 BRT will not use HOT lanes north of Brickyard P&R. Anything that speeds GP lane traffic is anticipated to improve transit performance too. WSDOT staff believe that relieving the bottleneck north of Canyon Park may even ease traffic back to SR 522. WSDOT hopes to open the shoulder lanes to traffic by Summer 2017. In the longer run, bus and GP performance in the corridor will be improved by adding a second HOT lane at the north end of I-405. That project is estimated at $570 million and, despite some more recent political interest, is not funded. I-405 BRT investments are described in this recent slide presented to the I-405/SR 167 Executive Advisory Group. The trend towards shifting general taxes to user fees is appropriate, and congestion management through user fees in the most congested time periods makes sense. With the population increasing each year, using those fees and taxes to build more capacity is also very appropriate for the vehicles that predominately use those roadways – cars, trucks and then buses, in that order. Cars still carry the vast majority of trips so meeting future demands should remain front and center on any proposal. And that is why we need to invest in transit: to meet those future demands, which can’t be met through cars for reasons of simple geometry. I would agree IF that were the case. Unfortunately, even adding all the improvements of ST3 to the mix, transit still only carries 5% of the total regional trips. So, NO, you can’t ignore the fact that 40% more people are on the way here, and will surely bring their cars with them. Until you figure out how to move them onto buses and trains without legislating them on-board and throwing the scofflaws into ‘Transit Detention Camps’ then the auto needs will need to met. The only issue is that most of the stops on 405 are not really walkable. Totem Lake and Brickyard at least have some walkability, but I’m not even sure if there are apartments within walking distance of the Canyon Park stop. So to increase transit demand, you’re going to need to increase the P&R lot, which is unsustainable. Local bus service is not going to help much either – at best it runs every 15 minutes, and then you need to wait for the express bus. Most people won’t do that. Of course the only really walkable bus stop (Bothell) is being cut out from 405 BRT, so that makes things even harder. We’ve got a two-pronged plan. (1) Frequent, abundant, grade-separated transit, and (2) filling SOV lanes with congestion. @William C – WSDOT long term plan includes expansion of 2-lane HOT the entire length of 405 & much of 167 – so highway expansion but in theory supporting transit. @David – I can’t speak to land use, but Canyon Park will be the terminus of SWIFT 2. Unfortunately, transit isn’t free to provide, especially to 1970-2010 built suburbs. Drivers and mechanics have to be paid; parts and fuel have to be bought; new buses have to be purchased; and huge garages have to be built. But if those things are done — and they may or may not be a good use of limited money — then transit is clearly able to serve many more trips per lane mile than are private autos. There’s also a logical disconnect: cars carry the vast majority of trips now so we must plan for them to be the majority of trips in the future. But isn’t that causing the future you’re predicting? If transit is infrequent, stuck in traffic, and doesn’t go where people are going, then won’t people have to use cars in the future as well as now? But if we built a transit infrastructure so people can get out of their cars without extraordinary unreasonable sacrifice, then some of them will gladly switch, and others will be willing to switch. It’s a both/and. Most forecasts still include majority SOV trips even with a dramatic increase in transit’s share of trips. For example, if we assume something crazy generous like 75% of all trip growth along 405 is absorbed by transit, we’d still need to add highway capacity to accommodate SOV growth above and beyond investment in transit. I’m curious if that HOT lane extension north to I-5 will include direct access ramps. Otherwise, it’ll be chaos there, as the vast majority of HOT users will need to be in the far right lane to go north on I-5. Currently, the left lanes there go to Mukilteo, not exactly a prime destination. I don’t believe there’s anything specific yet. WSDOT doesn’t have the funding or a timetable for a second HOT lane. 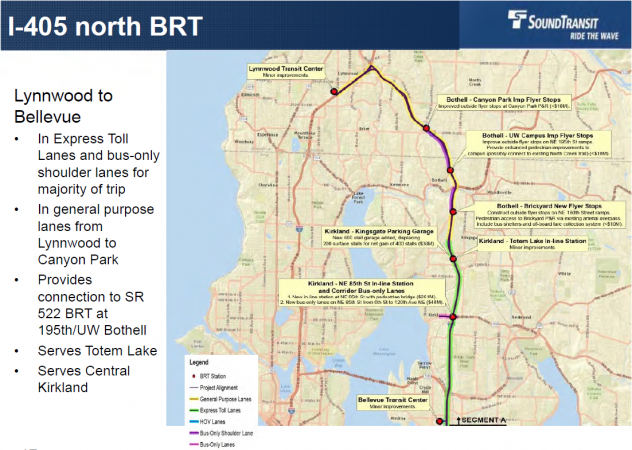 However, there was some discussion at the Board about adding Sound Transit investments to the I-405 BRT project if WSDOT was funded for the corresponding highway improvements. It would surely make sense to construct new ramps and new lanes at the same time, so I think this is the Board recognizing it should be responsive if/when WSDOT has the money. The current ST3 plan is no, but I gotta believe that if/when the 2nd HOT lane is added, the 405 BRT stops will shift from flyover to inline? Doubtful. They could have added an inline stop at Brickyard but didn’t even though WSDOT basically rebuilt most of that area. If they do add one, it would probably be at Canyon Park, and then run the buses in regular lanes for 195th St and Brickyard. I think WSDOT needs to get ouf of the moving cars and into the moving people business. But that’s me. Considering the paucity of buses using I-405 north of Bothell, there’re a number of previous steps that’d need to be taken there. WSDOT has no choice. The state constitution requires all gas tax money to go to highways. And, actually, WSDOT is doing what the law allows. All their big projects in the Seattle metro are either replacing failing structures or adding HOV lanes. Donde, remember that the 18th Amendment to the Washington State Constitution has been ruled by the courts to permit Park and Ride facilities and the Washington State Ferry system, because these further high purposes. So Tollstoppers (you guys specialize in the Foxtrot or the Charleston? ), I think I’ve got a solution for everybody. I agree with you that HOT lanes are pretty lukewarm for a highway anywhere in our State. So let’s truly abide by our Constitution’s language, and use same money for a fully-reserved transit lane system, ramps and all? That way, at all hours including rush (well, we can’t keep him off, or Dori Monson and Michael Medved either but have driver tell them to keep it down) I-405 users could be using using away at 70mph. While keeping their cars garaged at home or in park and rides so they don’t interfere with other users rights except freedom to chase Pokemons over their fellow citizens’ hoods and roofs. Gimme a minute to put the badger back on my head…DEAL? The issue is metrics. Is a highway successful if it moves the most vehicles? Or is it successful if it moves the most people? One metric counts a sedan, a bus, a Hummer, and a van all the same. The other counts vehicles according to their typical number of passengers. Why do highways exist? To move people. If they were just to move vehicles, then the world would be like the movie “Cars”. To move the most number of people at the lowest unit of cost (both for government and people). That said, there is a whole palette of options to choose from, many of which are not on anyone’s radar scopes. More buses and trains are part of the solution, but let’s not kid ourselves to thinking a bus in every neighborhood every 15 minutes is the answer to all our problems. I’m calling B.S. on this. Fifth, to say that transit ridership is up 8.2% means they are up by a whopping 250 riders PER DAY. That isn’t even keeping pace with the growth over the region and is a travesty that they kicked out around 20,000 people who were in 2-person carpools. Probably most of those new bus riders were already doing their part as a carpool before this absurdity started. BTW, the accident rate is still 55% higher than before the tolls were put in place. People are getting hurt because of the ETL. We here at Stop405Tolls.org have the best facts. They’re tremendous. Urbanists’ facts just don’t win anymore. Sad! Finally, Gov. Inslee stated how people clearly like the toll lanes because 600,000 people have used them. … I am one of those 600,000 people and I assure you, I do NOT approve of them. Then why do you use them? I don’t get that. The other lanes function just like they always did (slowly). If you don’t like the toll lanes, then don’t use them. I’m sure psychologists have a name for this phenomenon. I like to call it the “Load/Unload Parking fallacy”. I have heard otherwise smart people make this claim. While trolling for parking spaces, you notice a couple “Load/Unload” parking spaces, with no one in them. “If only they made those regular parking spaces — I would have a spot!”. No, no you wouldn’t. Someone else would have grabbed that spot already. The same is true with stupid white guys who complain about affirmative action. “They let in a black guy, and his SAT score is less than mine — if they just got rid of affirmative action, I could get into that school”. Again, no you couldn’t. Another, smarter white guy would take your spot. Likewise with this. If they just opened up the lanes to traffic all day long, it would be just as congested as the general purpose lanes are now. But people wouldn’t have an option to avoid them. Those in car pools, buses, or those willing to shell out extra money (including you — willing to dismiss your stated principal as well as your moniker) would all be worse off. How is that better? An “org” that uses the First Person Singular? Hmmm. Are you really a “[B]org”? So far a “hard shoulder running”, it wasn’t “the public” that thought of it. It was KC Metro, way back in the 1980’s when they started doing it through the Three Points cities inbound on SR 520. At least give credit where credit is due. Actually, if you were to add BRT (see the BRISK proposal), build dense, transit oriented development, and toll highways, people’s commutes would become faster because people can take transit easily to where they need to go and would avoid driving except when needed because they want to avoid the tolls. If you just add more general capacity lanes, traffic just expands to fit the capacity (“induced demand”). So what happens when there is a car breakdown? now we need to have two or three tow trucks on call for the period when should lanes are being used? Just curious how this pencils out? How does it work? My guess is that’d close the shoulder lane, but until it happens, people can use it. I’m all for that sort of smart, innovative use. That’s what bothers me. Weren’t the shoulder lanes supposed to be a safety feature? If a bus is running full-speed in the lane and a broken-down car is stopped there, then the bus would have to suddenly stop or crash into it. I don’t think buses run full speed on the shoulder. I believe they’re limited to 35 mph. And they have pretty good visibility, so they should be able to see any vehicle that’s stopped in front of them. Honestly, I’m more scared of buses running 65 mph in the express lanes since there are still enough idiots who decide to enter/exit them even when there is double striping (or even where they’re legally allowed to enter them but they have to accelerate from a stop to 60 mph). Doesn’t mean I don’t ride those buses, but one of these days there’s going to be a bad accident. The project includes an overhead signal system to notify drivers if the shoulder lane is open or closed. Yes, they intend to close the shoulder lane when they need to move an accident to the shoulder. I think that requires two things. Better visibility from HQ to highway conditions is one – the cameras don’t see everything yet. The second, already announced, are more trucks to respond to accidents and get them off the road quickly. 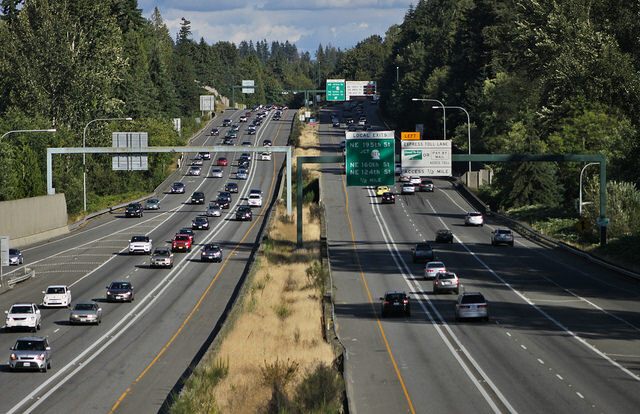 This project is part of WSDOT’s $1.3 billion plan for widening 405. The cost for this project is estimated at $11,800,000 for 1.8 miles of hardening the existing shoulder so it will be able to withstand auto traffic, adding a noise wall on part of the corridor and installing an overhead signal system to notify drivers when shoulder driving is allowed. That works out to about $6,550,000 per mile. One, if we let automobile demand determine highway width, how long will it be before your own house gets condemned for a 136th general purpose lane? Two, if I have to regularly get between Bellevue and either Lynnwood or Everett, who’s going to bail me out of a detention camp gated by twenty miles of traffic-blocked barbed wire? But three: Know blogs can’t expel people, but shouldn’t Sam at least get a footnote for comments like this? 1. I’m all-in with having people ride in jam packed trains and buses instead of in SOV’s. My bigger point is that the numbers say building the transit that’s proposed to 2041 only gets us a 1% bump, which ensures my house is a goner at some point. The cars are coming, and pretending they aren’t is just fooling ourselves everyone will get transit religion and ride the bus. 2. Transit Detention Camps are all the cars parked on roadways now – William C nailed that one above. 3. Sam is smarter than the average bear, and part Sasquatch, so careful what you say around here. Again, that’s a 1% bump in all trips, NOT in “trips in the I-405 corridor”. This is the favorite flaming straw-man of transit haters. You’re a reasonable guy, mic, don’t fall for it. I was thinking the tolls on 405 are not purely dedicated to improvements on just that highway segment, but there’s plenty of improvements on 405 that could easily consume the tolls. It’s generally understood that by 2040 most major highway segments will be tolled, or soon thereafter, so this is the bigger question of providing mobility for the anticipated loads and modes for the future. I’m now curious what the vehicle counts will be with or without ST3 along just the 405 corridor but don’t have time today to jump into it. Maybe you know that. Another difficulty with just looking at a corridor in isolation, is that much of the traffic on 405 is just passing through, and they certainly don’t have much of a transit option to choose from. Glad you’re still on duty, Mic. Reason I wouldn’t take 2041 numbers too seriously in 2016 is that in 1991 the World Trade Center was still standing. And the recession they were already in the middle of distracted everybody’s attention from the 2008 numbers. Also, the collapse of the Soviet Union had just assured that Russia would become a peaceful corruption-free democracy not led by the chief of the KGB. Whose business partner partner would be an embarrassment to the world of gangsters, capitalists, and the Russian tradition of quality fur hats. Number of automobiles coming into our region will be limited by criminal code’s limited flexibility for murdering your own children for the screaming volume with which they and their little brother murder each other for ten hours. In a car whose air conditioner global warming will fry after about three . But won’t happen. Because huge numbers of little boys- who always prefer trains to being stuck in cars-will be both fathers and voters. Cheating their own parents of the revenge their screaming biting train-demanding grand-kids were supposed to inflict on the former bad children who are now the kids’ parents. Though like many younger-parent-age train passengers, worried mainly about how their tattoos will damage their job prospects when interviewed by 25 year old billionaires whose dress code demands “Clean Skin”. Which is reason their lobbyists have provided them with laws not only allowing public nudism, but also limiting clothing-wearing as an unsafe working condition. For same reason Washington State Ferry trolley hydrofoils run fully reserved channels on Madison. Despite protests by gondoliers (the O Sole Mio! kind with mustaches, not crew on the Portland Tram) about wakes. So best get moving on those 2066 numbers and be glad your brain circuits are implanted with organic 3D printing so you don’t have to go around with that thumb drive stuck in your ear anymore. Leave that to that Sasquatch in the bear suit while you’re both wishing LINK would add that hundredth car to the train. Haven’t we had this conversation many many many times already that as soon as you make new lanes available they are immediately used and full? No more road expansions. Safety improvements, sure, but better land use and transit decisions and walking and biking. Wish it was politically possible to convert general purpose lanes to tolled lanes/transit only. That’s what WSDOT did on 405. People are complaining that there’s one less GP lane on 405 than there used to be, and that’s what’s causing the backups. My personal opinion is that we need people smart enough to handle the situation in the first place. Do they drive their own cars to work? Do they suffer with the insanely stupid traffic jams that their policies cause? It’s a complete disaster and not one thing they do will solve the problem. Buses don’t work for small business owners like me. I’m sure my customers are not going to like the additional 20-50 dollars I add to each days work for time loss on the road, but that’s what we are heading to. Get people with actual experience in solving problems, not just throwing mud against the wall. This problem is so bad that it’s become political instead of common sense. 54 billion for ST3. ST1 and ST2 are disasters and we are actually looking at funding another one. If it were private business doing this, someone would have been in jail long ago, or out of business. But since it’s Gov’t, not a word is said. Sickening. ST1 and ST2 are not “disasters” by any reasonable measure, Troll. I have a subway stop within walking distance of my house. I haven’t had to drive downtown all summer. Adding more lanes costs as much as transit, uses up lots of valuable land, and thanks to induced demand, traffic will fill them anyway. If you visit customer sites, then certainly, you need to drive. But you and people like you are far less that 10% of traffic. Do not argue for a system that screws everything up because some self-interested flack paid by hydrocarbon interests says their way will benefit you. Instead you should be advocating for high-occupancy vehicle use throughout the region so your service trucks can travel freely. That, sir, is an obvious solution. I’m glad that the 405 lanes are working for transit. They don’t seem to be working as well as they should for general purpose automobile traffic. 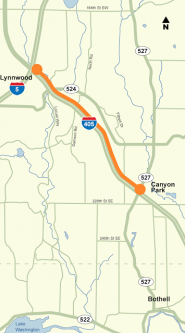 The 405 lines are optimized for someone who wants to live in Lynnwood and work in Bellevue. There are so few places to enter and exit the lanes that it’s truly optimized for someone traveling the whole stretch. Just look at the figures the WSDOT people quote: Lynnwood to Bellevue travel times. The toll lanes are hell for someone working in Bellevue and living in Kirkland. Sure, they can use the side streets and make life difficult for bicycles. No loss there. Somebody living in Kirkland and working in Bellevue has no rational excuse for not taking a bus. It’s fifteen to thirty minutes depending on which side of downtown Kirkland one lives. 1. How does that logic not apply just as well to someone living in Lynnwood and working in Bellevue? The bus makes sense for Kirkland but Lynnwood people should just drive their cars down the new highway lanes? 2. There are rational excuses for not taking a bus. Despite what you may believe, automobiles do offer more flexibility. Some circumstances require that flexibility. I’m not saying that the majority of people who commute would be better served by busses, but your comment strikes me as a bit naïve. Am I missing something? 3. My point is that the 405 HOV lanes are designed to improve the lives of people who choose (for whatever reason) to live far away from work. That’s an anti-optimization in my opinion. Still somewhat stilted language. What I mean is that I’m not arguing that people should drive. But saying people in Kirkland have no right to drive 405 seems odd. Most of Kirkland does not have a direct bus to Bellevue. The 234 and 235 run on Lk Wa Blvd, which has minimal walkshed. I’d need to ride the 245 and transfer, or bike 2.5 miles and 400′ elevation change to get a bus to Bellevue. Or I could go 245 to B. And all of these sit in the same traffic as my car. There’s also 116th and 140th.